Newly renovated condo! Fairway villa overlooking Oyster Bay Golf Links WIRELESS INTERNET-/Non-smoking - NO Phone. Two bedrooms/two full baths , 4 Double beds / sleeper sofa bed, cable television (3 flat panel TVs) featuring large screen flat panel in living room, DVD, VCR, central heat & air, washer/ dryer. The villa features an open floor plan with adjoining kitchen, dining and living areas - new Italian tile flooring throughout the common areas, new carpet in both bedrooms and a high cathedral ceiling. The entire condo has been freshly painted and has new mattress sets on all beds. The kitchen has been completely renovated with new cabinetry, granite counters/dining bar with 4 barstools & all new appliances. It is fully-equipped with dishwasher, microwave, coffee maker, blender, toaster, full-size refrigerator and range. A newly constructed spacious wrap around deck is accessible from the living room and master bedroom areas. 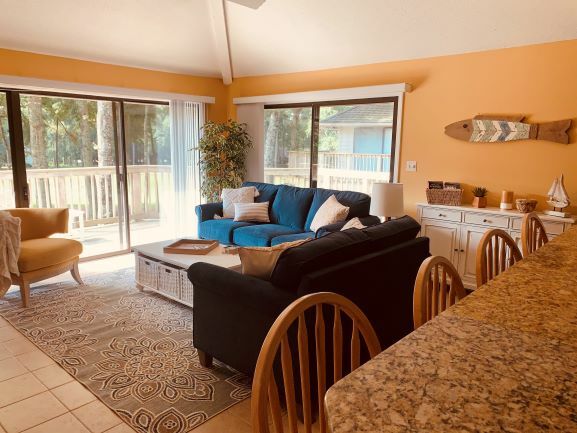 The second bedroom has a private screened porch to enjoy the outdoors.. Community pool, hot tub, charcoal grills and tennis courts on site Complimentary linens, towels and departure maid service.